TORONTO, July 21, 2016 – OPSEU has appointed Giulia Volpe to OPTrust’s Board of Trustees in July 2016. Ms. Volpe is a Pension Analyst with the Ontario Pension Board (OPB) in Toronto. 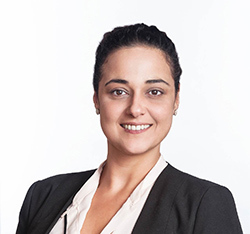 She has over a decade of experience in public sector pension plan administration primarily providing frontline client service to OPB’s members and pensioners. Ms. Volpe is a strong union activist with considerable labour relations knowledge. She has held the roles of Labour Management Committee Co-Chair and Interim Co-Chair, Joint Occupational Health and Safety Committee with OPB. Most recently, she was elected to serve as the Vice-President of OPSEU Local 568. She holds a General Arts and Science Diploma from Seneca College, a Pension Plan Administration Certificate from Humber College and a Registered Retirement Consultant (RRC®) designation from the Canadian Institute of Financial Planners.